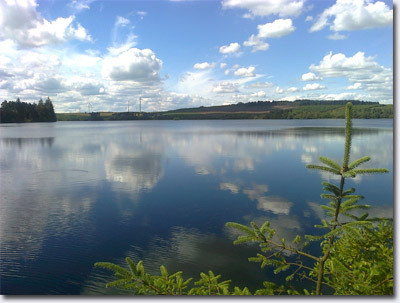 Sweethope Lough, part of the Ray Estate, is a renowned stillwater located in the Northumberland hills. Sweethope's two lakes, the Great Lough of 140 acres and Little Lough of 12 acres, are the headwater of the Wansbeck River which cuts its scenic way to the North Sea through some of Northumberland's prettiest scenery. Two well equipped holiday cottages are located on the southern bank of the Little Lough, and a five-pitch caravan site on its north bank. Over the last 35 years or so Sweethope has enjoyed an enviable reputation as being one of the region's best trout fly fisheries. Popular with anglers of all ages, Sweethope has also been a busy venue for charity and fund-raising events including its annual challenge competition for anglers with disabilities. Sweethope is also proud to have been chosen as the venue for many local and national angling clubs, numbering over 30 clubs per annum in recent years. Fishing and outdoor activities at Sweethope are managed by our partner Sweethope Adventure. For more information about our fishing please visit Sweethope Adventure or call the Fishery Manager 01830 540349 or Tony 07791707097.